Description: Tansman’s 19-minute trio of 1938 is a typical example of his French-inspired neo-classicism of that period: charm and serenity in its first movement, a Mendelssohn-meets-Bartók scherzo, a neo-baroque Arioso and a machine-like rhythmic finale with polyphony almost ever-present. Tchaikovsky’s two-movement work from 1978 is of almost exactly the same length but its roots are in Viennese Expressionism and especially Berg. Its harmonic sophistication, polyphonic saturation and its wide range of emotions can allow the listener overlook that the music is actually atonal. 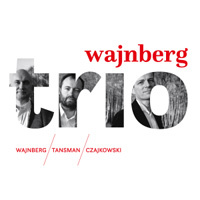 Wajnberg Trio.